CD1 First engine of the CD1/2 high speed duplex printing system. Model CD1 does not contain its own control unit and must be used with Model CD2. CD2 Second engine of the CD1/2 high speed duplex printing syste. Model CD2 contains the IBM control unit and can print in simplex (without CD1) or duplex (with CD1). The IBM Infoprint 5000 color printing system can address requirements for speed, quality, reliability and ease of use for transactional printers, service bureaus, direct mailers and book printers. IBM intends to enhance this production color printing platform in a phased release that, over time, will leverage IBM's server and controller technology, advancements from the AFP Color Consortium (AFPCC) and IBM's workflow portfolio. Use automated workflow to centrally control printers and improve job-level process integrity. Inkjet print heads using piezo-electric drop-on-demand technology Achieve high print quality on statements, direct mail, marketing materials and books. Powerful IBM multi-computer printer controller that drives Adobe PostScript RIPs Get the power you need to drive high-speed, full-color printing at high speeds to help you fulfil requirements for quality and turnaround. Water-based pigment inks Produce high quality color print that is resistant to fading and smearing, even on digital EP paper. Roll-fed paper Gain the web flexibility needed to run one-up, two-up or three-up jobs to maximize productivity and minimize paper waste. The Infoprint 5000 provides web width of 20.4" (518 mm) (up to 19.96" (507 mm) printable area) and the ability to support a range of media, including electro-photographic paper. Note: The Infoprint 5000 (Machine Type 5101) is not available in Latin America. The IBM 5101 Infoprint 5000 Model CS1 is a high speed, high quality simplex printer. 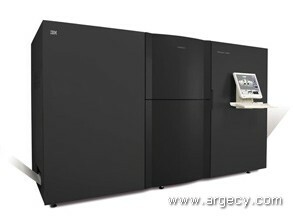 The IBM 5101 Infoprint 5000 Model CD1 is the first engine of the CD1/2 high speed duplex printing system. Model CD1 does not contain its own control unit and therfore must always be used in conjunction with Model CD2. The Infoprint 5000 Model CD2 is the second engine of the CD1/2 high speed duplex printing system. Model CD2 contains the IBM Control Unit and can be used to print in simplex (without the CD1) or in dual simplex or duplex by mating with the CD1. The Infoprint 5000 family of printers are designed for very high-throughput color production printing environments. The Infoprint 5000 is targeted at printing environments where good print quality, and superior reliability at high printing speed are critical factors. These printers feature a 19.96-inch (507 mm) print width, and tractorless operation. The maximum print width of the Infoprint 5000 family is 19.96 inches (507 mm). The following table shows the maximum print speed of the Infoprint 5000 Models CS1, and CD1/2 in ipm. Note: (2) Resolution is in dpi (dots-per-inch). The Infoprint 5000 uses an integrated tractorless paper drive. The tractorless paper drive allows either pinless or pinned paper to be used. Note: Some pre- and post-processing devices require the use of pinned paper. Pre- and Post-Processing equipment that support a tight web is required for the Infoprint 5000. A type 1 interface modified for the Infoprint 5000 is used to attach pre- and post-processing devices. The Infoprint 5000 tandem duplex system consists of two printers (the CD1 with the CD2) that work together to print on both sides of the media. The following table summarizes the Turnbars required for the Infoprint 5000 Models CD1/2 duplex configurations. The web cleaner with the correct voltage must be specified when the printer is ordered. The web cleaner contains a universal attachment kit to allow its attachment to an unwinder and is powered separately from the printer. Note: "All" refers to models CS1, CD1, and CD2. The following must be included on all initial orders for a Model CS1. Paper Width is 6.5 to 20.5 inches (165 mm to 520 mm) tractorless. The Infoprint 5000 has a print width of from 6.0 to 19.96 inches (150 to 507 mm). Paper weights between 64 and 130 gsm (17 to 35 lb) are supported. Paper should be tested with the targeted applications before production quantities are ordered. Certain applications may cause excessive wear or premature failure of some components of the Infoprint 5000. In these situations, a customer with maintenance provided under the IBM Customer Agreement of IBM Machines may be responsible for additional maintenance charges. Barcodes should be tested on the target paper with the target application prior to implementation. The Infoprint 5000 fonts are listed in the "Planning and Configuration Guide". The Infoprint 5000 is designed for efficient ease of operation, service, and installation. Accepted human factors principles have been applied specifically to frequent access areas such as the operator interfaces. The operator flat-panel touch-screen, and associated keyboard and mouse are provided to facilitate and enhance the human interface with the printing system. Note: (4) Approximate weights are supplied for customer planning use. The Controller must be located adjacent to the printer. The "Planning and Configuration Guide" contains detailed information regarding space and footprint requirements. Actual weights may vary from the above. In order to achieve and sustain best machine performance and print quality, the Models CS1, CD1 and CD2 must be operated within the following environmental envelope. For more specific printer environment information, please see the "Planning and Configuration Guide". An integrated 10/100/1000 Ethernet Gigabit TCP/IP adapter is included with the Infoprint 5000 Models CS1 and CD2. The Infoprint 5000 Models CS1, CD1, and CD2 are designed to print PDF Level 1.6 and PostScript Level 3 print jobs. The printer controller uses Microsoft Shared Folders as "hot folders" for receipt of print jobs. From a print submission workstation or server, users will map the hot folder to their local system and copy files to it to get jobs into the printer. Hot folders may be configured with unique job attributes. The printer features a simple 2-up function suitable for slit-merge finishing applications. Any other changes to document format and layout may require additional processing with imposition software before a file is submitted for printing. IBM Infoprint Transform Manager V1.2.0 SP3 (5639-P51), or later, and the IBM AFP2PDF Transform for Linux V1.1 (PRPQ 8A8174, 5799-TWL) are installed. AFP and line-data if IBM Infoprint Transform Manager V1.2.0 SP3 (5639-P51), or later, and the IBM AFP2PDF Transform for Linux V1.1 (PRPQ 8A8174, 5799-TWL) are installed. IBM Print Services Facility for z/OS, IBM Print Services Facility for VM, IBM Print Services Facility for VSE, and IBM Print Services Facility for iSeries software platforms do not support the Infoprint 5000 Models CS1, CD1, and CD2. As with any transform, IBM's AFP2PDF transform must be tested and verified with the target applications prior to putting the application into production. The publications listed below are shipped with a Model CS1, and CD1/2 Printer. If available, these publications are shipped in the appropriate language. The following is a summary of the initial order specify codes required to order an Infoprint 5000 Model CS1, CD1 and CD2. Specify one Turnbar for each model CD1.